Matthew Sampson didn&apos;t know Jeffrey Hammond Long, but he made the memorial that marks his death in downtown Washington, D.C. In July, Long, 36, was cycling through an intersection when he was struck by a turning truck. He died a day later in the hospital. After reading the news, Sampson issued a somber callout on Twitter asking for someone to donate a bike. The next weekend, he painted it completely white and chained it to a post at the site of the collision. Sampson typically makes playful pop-up street installations, publicizing his antics as the self-appointed D.C. Department of Transformation on Twitter. This project was different though: It was his first "ghost bike." "It&apos;s made me angry because I should be safe biking around here, and I&apos;m not," Sampson said. 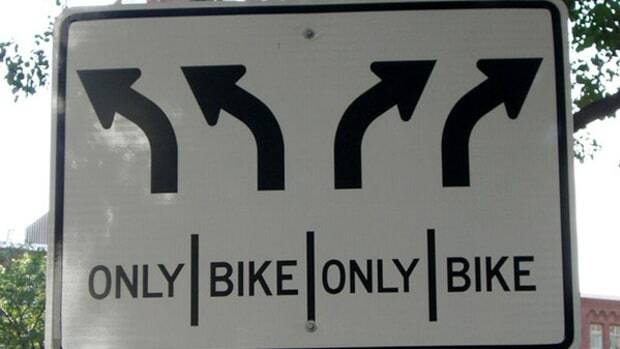 "This should be a safe intersection, but it&apos;s not." 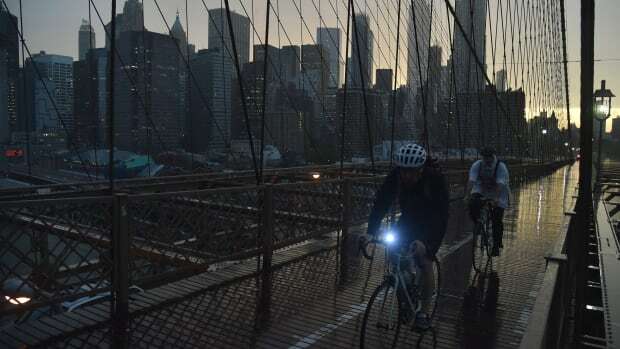 A week after Long&apos;s death, more than 100 bicyclists joined in a silent memorial ride during rush hour. His ghost bike marked the final destination, where cyclists gathered to lay down their bikes. They stood silently for about 20 minutes. Some cried as Long&apos;s friends left pictures and notes by the white bike. Most had never met him. "Ghost bikes make the invisible visible," says Reverend Laura Everett, who has liturgy for dedicating a ghost bike in her book, Holy Spokes: The Search for Urban Spirituality on Two Wheels. "They force us to notice that we are passing by a place where someone has died, to acknowledge that our roads are often places of violence, and that we are vulnerable and fragile humans, and we can do something to make sure we all get home alive." 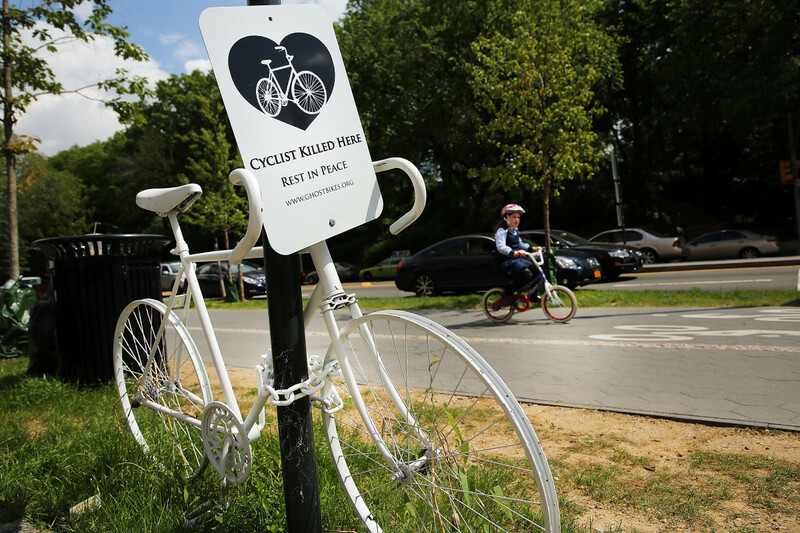 The practice of putting up white bikes to commemorate car-bike collisions began in St. Louis in 2003. Originally, they marked the sites of both fatalities and non-fatal injuries. Patrick Van Der Turin started a project called "Broken Bikes, Broken Lives" after he witnessed a minor car crash and he began marking crashes he found on police reports, as Grist reported. "It wasn&apos;t a community act at first. It was kind of underground," Everett says. At first, it was even a defiant or subversive act, a kind of guerilla street art that city officials removed quickly, sometimes within days. "It wasn&apos;t always clear who put it up or where it came from. ... While that is still somewhat true, we&apos;ve moved those gatherings to the daytime and held ceremonies." Even the term "ghost bike" predates the symbol&apos;s more somber meaning. In Pittsburgh, bike advocacy director Eric Boerer decided to imitate the project after he was hit by a minivan and broke his legs. He placed bikes around the city at the sites of crashes, and his friends came up with the phrase and set up the site ghostbike.org. 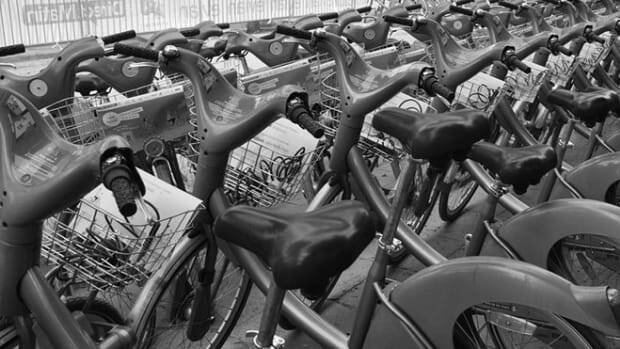 But the bikes took on new meaning as cycling&apos;s share of traffic deaths has increased nationally—now they&apos;re primarily reserved to commemorate cyclist deaths. That change means Boerer, who co-founded Free Ride Pittsburgh in 2002, had the odd experience of placing his own ghost bikes. "We were originally doing it to create awareness of street safety. But once they became synonymous with fatalities, especially in a media-savvy place like New York, they took on that roadside memorial and people kind of respected them more," Boerer says. 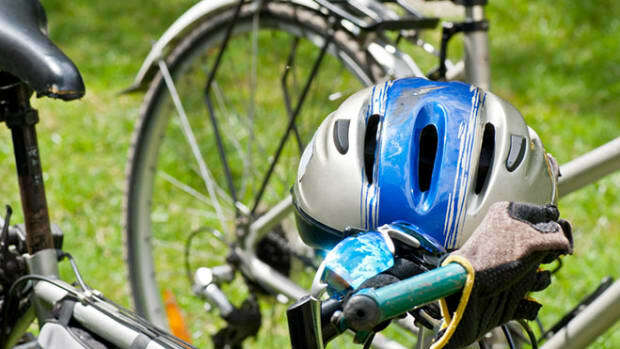 Federal statistics report that 840 bicyclists were killed in crashes in 2016, the most recent year with data. But Boerer notes that Pittsburgh has had a relatively low number of cycling crashes compared to other cities. The city hasn&apos;t had a deadly crash since August of 2016, and Boerer says the original ghost bikes played some part in that change. Today, ghost bikes are common enough that busy people in the city can walk or drive right past them without noticing. But sit still long enough at a busy intersection and you&apos;re bound to see someone stop to take in the sight of a white bike sometimes decorated with flowers and pictures. They may even touch the handlebars or seat as they pause to consider a life lost on two wheels. "It&apos;s so visually striking," Boerer says. 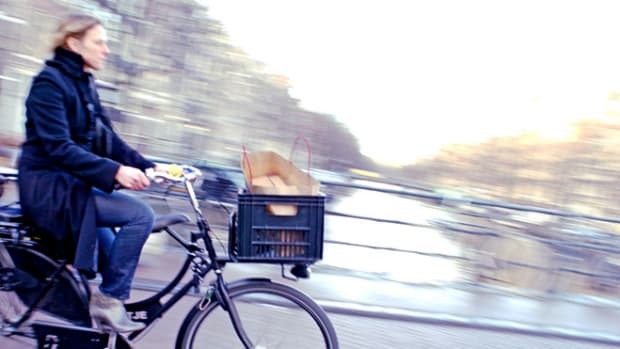 "In a weird way, it&apos;s done what a lot of advocates have struggled to do: It humanizes bicyclists. It drives home the point that there&apos;s human beings on those bikes." when we travel past this spot, remind us of [the cyclist&apos;s name]. "Regardless of one&apos;s religious background or tradition, finding ways to gather, to grieve, to lament, to honor, to mourn well are universal. One of the things that happens when we gather to grieve that a life has been lost is that we learn that we do not grieve alone. There&apos;s something communal in ghost bike ceremonies." Everett says that the ceremony is just as important for the people in the community to see each other, breaking the anonymity and isolation of a city. Most of the time, a majority of the audience may not even know the victim. "As a pastor, I&apos;m used to doing funerals in churches where the people who gather know the dead, or have some relationship. I am regularly, profoundly moved by the sense that there&apos;s a shared vulnerability with someone people don&apos;t even know," she says. The participation in these dedications speaks to how much road violence affects a whole community, and reminds people that our roads are shared even if we don&apos;t always behave like they are. "It&apos;s not just cyclists that show up. It&apos;s the neighbors, it&apos;s the construction workers who always knew that was a dangerous corner, it&apos;s the cops who are also on their bikes who know how dangerous it can be, it&apos;s the pedestrians who walk past that spot every day. Sometimes we&apos;re just passing through, sometimes we live right at that spot, but when we gather, we see who our neighbors are that we might have passed by without noticing." Ultimately, though, Everett isn&apos;t resigned to addressing cycling deaths through thoughts and prayers alone. "I truly believe that a vision of zero traffic fatalities is possible. That we can make better decisions about our infrastructure, our roads, what we fund, what we prioritize. We can do better than sacrificing people to the road." Boerer says he has no doubt that ghost bike memorials have added some moral heft to bike advocacy. "Ghost bikes offer an important way to both respect the person as well as help push for change," he says. Back in D.C., the recent fatalities have galvanized bike advocates who say the city hasn&apos;t done enough to address road safety for cyclists and pedestrians, culminating in a protest outside the mayor and city council&apos;s offices that included speeches from Laura Montiel, Malik Habib&apos;s mother, and Cyrus Habib, his brother who witnessed the crash. Members of the District&apos;s Department of Transportation attended the memorial rides for Long and Habib. "We&apos;re here as members of the community mourning this tragedy," DDOT director Jeff Marootian told CityLab at Long&apos;s memorial. "It&apos;s our responsibility to constantly be thinking about our Vision Zero strategy and what we can possibly be doing to make our city as safe as possible." In direct response to the fatal crashes, the city has since implemented some safety fixes to the intersection where Long was struck. Mayor Muriel Bowser also directed DDOT to research what&apos;s called a "flange filler," a plastic material that would make streetcar tracks safer for bike tires. That fix was one of the main requests from Laura Montiel as she spoke to the group of cyclists who gathered for her son&apos;s memorial ride. Montiel says she first learned of her son&apos;s ghost bike when Cyrus biked past it on his way home the day it went up. He took a photo and sent it to her. "On my way here, I stopped by it and I saw two people look and stare at the bike, and look around and be more aware of ... what was going on around them." She hopes the bike spreads awareness of how deaths like her son&apos;s can be prevented. "I want them to realize what happened there," Montiel says. "I didn&apos;t know about Vision Zero but now I&apos;ve started researching it ... so now I&apos;m learning new things. When they see the bike, I want them to do the same, so they&apos;re aware and they&apos;re safe and everyone makes it home."